Betty White stars in this early TV sitcom. This is a rare collection of 20 full-length episodes in a 6 DVD set. Very delightful television and what makes them a joy to watch is that the shows feature the 1957 Plymouth. Digitally remastered and restored. Run time approximately 600 minutes. A Date With the Angels. The series revolved around newly married Vicki Angel and her insurance saleman husband Gus Angel who get themselves and their friends and neighbors into various comedic situations. Besides Betty White and Bill Williams, among the series’ guest stars were Nancy Kulp, who would later play Miss Jane Hathaway on The Beverly Hillbillies, Chuck Connors, who is better known as Lucas McCain of The Rifleman, and Williard Waterman who was TVs Great Gildersleeve. 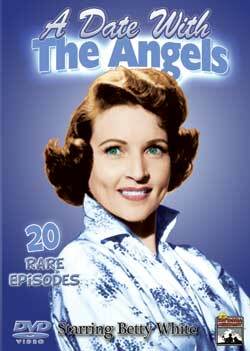 There are six DVDs in this A Date With the Angels Collection. EPISODE TITLES: High Fever, The Wheel, The Tree in the Driveway, The Feud, Shall We Dance, The Blue Tie, The Surprise, Pike’s Pique, Return of the Wheel, The Gorilla, Everybody’s Baby, Catered Party, Diane, The Burglar, Chip Off the Old Block, A Day at the Track, Wheeler at the Cabin, The Train, Double Trouble, Francis Goes to School.